Today the world lost another good pet. A pet with a good story. You see, about 15 years ago, my sister’s cat Yellza (named that because it yelled a lot) ran away. Around that same time, J Bo’s friend Bill found a cat near my house that resembled Yellza, and adopted it. Bill found the cat near Burkett Elementrary School, so he creatively named the cat Bur Cat (get it…Burkett). Was it a twist of fate that Bill ended up with our cat? No one will really know, but it’s always sad when someone loses a pet. Bare with me – this story is going somewhere. Today when I was browsing People.com, I learned that Taylor Swift is a fan of Cat Paint. 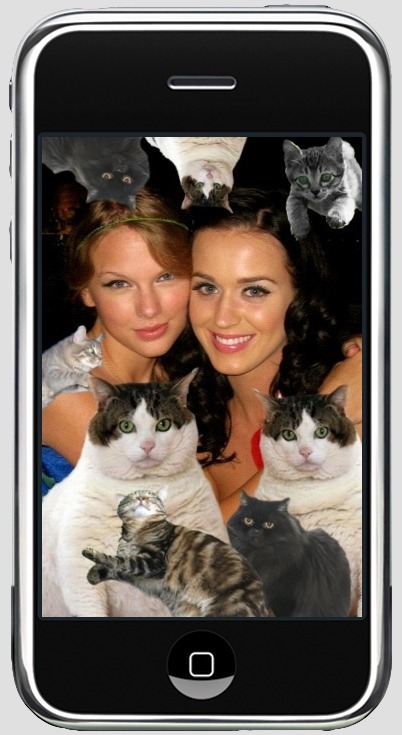 A downloadable app, Cat Paint is exactly what its name means. It paints cats on to your pictures. I was saddened that my un-Apple-self could not make some Cat Paint pictures, so you’ll have to look at these examples from T. Swift. If you are a cool iPerson and download the app, share it with me! This post is dedicated to all lost cats out there - dead or runaway. May you someday end up on Cat Paint. P.S. - Y'all know I really censored myself on the title of this post ; ) Keepin' it clean on the blog.